I discovered interceptors. Or, more accurately, I discovered that I could fly interceptors. When I first started, interceptors was one of the first skill books that I purchased for myself. I got it with the aim to eventually fly them around when I wanted to run from point A to point B in a small fast ship. Chella just never reached the point where she could fly them. Every time I started her on Gallente Frigate V I got distracted by something else. While doing something else I idly checked to see if Sugar could fly interceptors and to my surprise, she can. Thrilled, I stole the skill book that has been sitting in a container for almost a year now and plugged it in. Now I can try my hand at interceptor tackle sometime or another. However, I'm mostly just obsessed with the ship. It is physically beautiful to my eyes. It looks like a dragon fly. I am often disappointed in the looks of ships in Eve. I grow used to them or don't mind them or am horrified by them but rarely do I look at them and go "Oh my how lovely". I've noticed some Minimtar ships have quite the insectile design philosophy going on. My Scimitar reminds me of an insect and I named the Stilitto Dragon Fly because well... it is. I ran around a bit today and saw something interesting. Nulli often times hangs out in the area. However, a massive spike like that was unexpected. 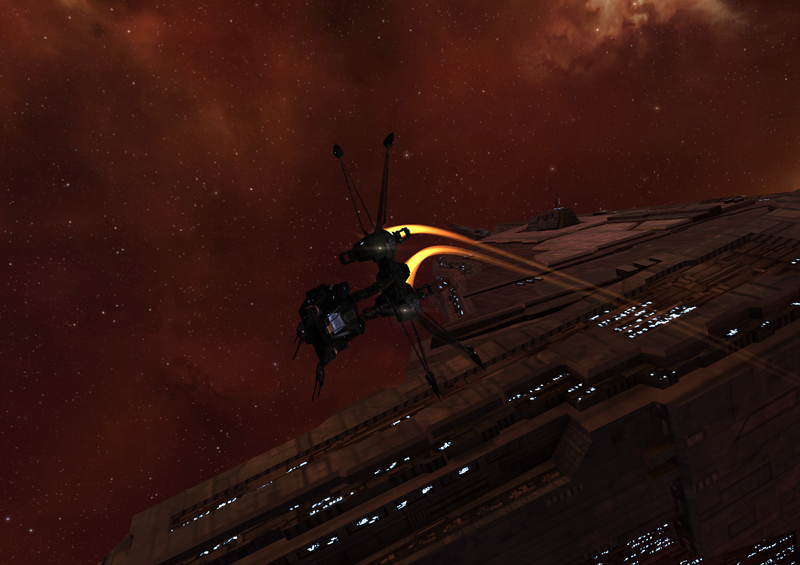 Nulli Secunda was moving its capital ship and super capital ship fleet. They decided to take a detour through Molden Heath. Local spiked to over 60 people. Only three belonged to my corp. When I undocked to see what was there I was greeted with a dscan containing, 9 Aeon, 13 Archon, 2 Avatar, 2 Chimera, 4 Erebus, 1 Leviathan, 1 Moros, 4 Nidhoggur, 12 Nyx, 4 Revelation, 1 Rorqual, 9 Thanatos and 2 Wyvern. There was also a Anshar rolling along. Probably full of fuel for all of those caps. I guess they are moving per their new plans. To bad I didn't warp to the cyno to snap a picture of all that capital ship. The ship names were pretty amusing. The things one sees puttering around can be quite interesting.